Demand for fresh cut culinary herbs is on the increase in the southern piedmont region of NC. Initial trial show that mint can be successfully commercially grown in this region of NC. Mint was chosen as it is a widely used culinary herb and there are few growers of culinary herbs in NC. Spearmint was selected as the variety as it is some of the most useable mints. Mint is an invasive plant and should be grown in an enclosed area or container. 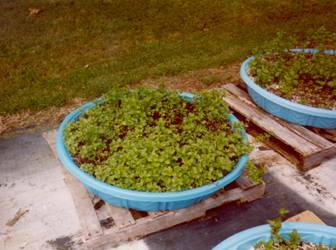 For ease of planting and harvesting, we use five foot diameter kiddie pools as growing containers. Holes are punched in the bottom of the pools and they are placed on pallets to allow for proper drainage. The pool is filled to a depth of six inches with a peat lite mix consisting of 55% Canadian Sphagnum Peat, Perlite, and Vermiculite. Root cuttings (Mint does not grow true from seed) were planted on a five inch on center spacing. Once the plants start to grow, approximately seven days, they were placed on a 30 day fertilizer cycle using a standard 15-30-15 mix. Plants are watered as necessary to maintain the growing medium in moist but not wet condition. From planting to harvest was seven weeks. First harvest yielded 1lb.per 10 square feet of growing space. As the plants propagated over the next six months, yields increased to 1lb. per 4 square feet. Mint goes dormant during the winter, and so it is only viable as an outside crop for about seven months per year. Once established, it will come back in the spring. We grew some inside a greenhouse where nighttime temperatures were maintained above 50 degrees throughout the winter. Mint can be successfully commercially grown in this region of NC.